Katie Dinan and Nougat du Vallet. Photos – © The Book LLC. North Salem, NY – May 19, 2013 – Three teenagers and a veteran rounded out the jump-off in the $100,000 Empire State Grand Prix presented by The Kincade Group, and the first to go in was the one to return to the winner’s circle. Nineteen-year-old Katie Dinan of New York, NY, and her energetic partner Nougat du Vallet were double clear to win the biggest class of the Old Salem Farm Spring Horse Shows, which ran May 7-12 and 14-19. Today’s competition concluded two great weeks of equestrian sport in North Salem with incredible entries and top horses and riders. The $100,000 Empire State Grand Prix had 37 competitors, and they rode over a course designed by Anthony D’Ambrosio of Red Hook, NY. Riding second in the order, Dinan and “Nougat,” a 12-year-old Selle Francais gelding by Scherif D’elle, made it look easy as they bounded through the course for the first clear round. They returned first for the jump-off and set a quick pace and the only clear round in 39.898 seconds. Nineteen-year-old Meg O’Mara of Rumson, NJ, was next in on Aragon Rouet, a 2000 BWP gelding by Baloubet du Rouet x Remondo, owned by Walstib Stables LLC. They pulled a rail at the first jump and had another jump down for eight faults in 45.182 seconds for fourth place. Last to go in the jump-off were last week’s grand prix winners, Todd Minikus of Loxahatchee, FL, and Legacy Stables’ Uraguay. Minikus looked to be on pace for another win, but after a rail, they continued through the course to finish in 41.930 seconds and second place. For Dinan, this was a turning point for her year. Having just finished her freshman year at Harvard University on Saturday, she returned to Old Salem Farm ready to prepare for a big summer of competition. “He had last week off. I showed him in a 1.40m class on Thursday and he jumped really well, (and then) I had to go finish up at school. I officially finished my freshman year yesterday, so I told everyone I was going to be in a really good mood on Sunday, no matter what! Now I’m extra happy,” she beamed. Dinan puts her win here among the top on her list of accolades. “For prize money-wise, this is the biggest grand prix I’ve ever won, and it’s really exciting. My other horse Glory Days was really good. We were one of the faster four-faulters and finished seventh. I thought it was one of our better grand prix rounds we’ve done. It was really nice to end on that note with both of them because we go to Spruce Meadows in two weeks,” she said. 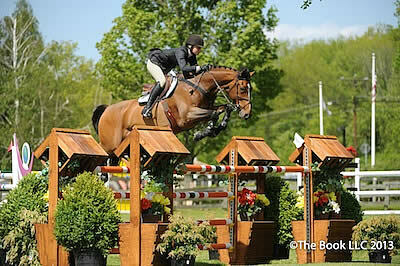 The $15,000 High Junior/Amateur-Owner Jumper Classic had 34 entries. Two were able to go clear in the first round, but after Michael Hughes and Luxina withdrew for the jump-off, it was an automatic win for Lillie Keenan and Londinium. The fastest four-faulter in the first round for third place was Philip Richter on Ray Ray. Keenan won a gift certificate from Der Dau. While Keenan said she “doesn’t like winning by default,” she was happy to gain another victory and wished the best for Hughes and his horse. She has ridden her recent High Junior Jumper partner Londinium, an 11-year-old Oldenburg gelding by Lord Pezi x Cascadeur, since January of this year. Keenan noted that Londinium had plenty of experience on grass having shown in Europe with his previous owner, who had him since he was four years old. In her own riding, she planned to “ride a little defensively” with today’s inclement weather. Keenan credited her horse as well as her trainer, Andre Dignelli. “Having Andre at the in-gate gives me a lot of confidence,” she said. In addition to her success in the jumper ring, Keenan swept top honors in the hunter ring. Riding Brodeur, she was champion in the Small Junior Hunter division. Their four blue ribbons also gave them the Grand Junior Hunter Championship. 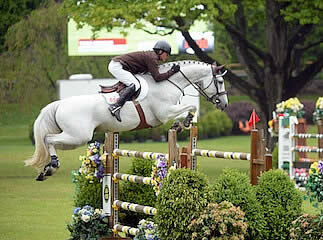 Brodeur (above left), a six-year-old Warmblood gelding, is owned by Madeline Placey. Keenan had another win in the equitation as well in the Governor’s Perpetual Hunt Seat Trophy class with Clearway. Kelli Cruciotti and Monterrey were second, while Sydney Shulman and Eli finished third. For all of her top finishes, Keenan was named the Best Junior Rider on a Horse. The $5,000 Low Junior Jumper Classic was the opening class on the Grand Prix Field this morning and was sponsored by Kaplow Insurance Agency and Catlin Insurance Company. Twenty-six entries contested, and six of those went through to the jump-off. Michael Hughes and Splash were the fastest of two double clears in the jump-off for the win in 31.700 seconds. Jacqueline Shilen and Wenda AK were second in 41.982 seconds. Finishing with four faults in the jump-off in 33.518 seconds, Anna Cardelfe and Firenze van de Cadzondhoeve were third. Kenzie Snyder and Waterloo were also the fastest of two double clears in a six-horse jump-off, this time out of 27 original entries in the $5,000 Low Amateur-Owner Jumper Classic. They finished in 34.533 seconds for victory. Just off the pace in 35.258 seconds, Michelle Kamine and Loreana were second. With four faults and a time of 34.447 seconds, Christina Fried and Winchester were third. 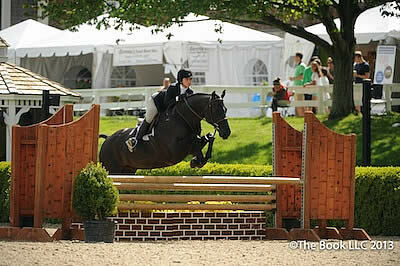 The Old Salem Farm Spring Horse Shows celebrate its 31st year in 2013 and offer two weeks of exceptional equestrian sport on May 7-12 and May 14-19 at one of the nation’s premier and newly renovated equestrian facilities, Old Salem Farm, in North Salem, New York. Old Salem’s beautifully manicured grounds, list of elite horses and riders, and fantastic social gatherings draw spectators from Westchester County and beyond to watch horses and ponies of every size compete for almost $500,000 in prize money. The Old Salem Farm Spring Horse Shows feature over 130 hunter and jumper classes each week, bringing together top competitors, including Olympic show jumpers, from across the country. For more information, please visit www.oldsalemfarm.net/mayhome.